I love inking. Who doesn't really?? Something so simple really changes the way a whole page looks. 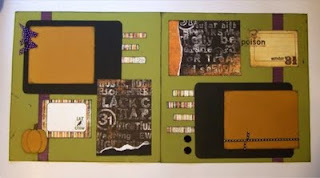 I did this layout for the scrapbook store in Sherwood, called Just Scrap It. We did a workshop to get people comfortable with inking, ribbon using and rub-ons. I'm addicted to all of those things. She who dies with the most supplies WINS! Anyway, what do you think of this layout? The pumpkin is just three ovals punched out, inked and glued. The stem is a little bit of SU! ribbon just glued on. Gotta love those punches. : ) Happy Halloween! If you would like please come visit me at littlemissheirlooms.blogspot.com and enter my current giveaway. I try to have a new and AMAZING giveaway every Monday so I hope you decide to become a follower so you don't miss out! I love this! Your pumpkin looks awesome. This is awesome! Inking really does add to the look. Love it, the pumpkin is great! Very cute layout! I just found your blog and I'm loving it!!! This is a beautiful layout!!!! My fav cards of mine have inking on them....it really looks good to ink thinks & tearing....I love to tear...and skew cuase I can't cut straight...LOL. Information by CoveredInCrafts. Simple theme. Theme images by latex. Powered by Blogger.